If you’re done wandering food streets Arab Street and Haji Lane, check out the quirky watering hole that sits on the corner between the two: Panko, the newest baby from Unlisted Collection, is a cyberpunk-themed kushikatsu restaurant and bar. The concept of the bar is “casual, playful, and accessible”, and it’s headed by Chef Ishikawa who hails from a family of sushi chefs with 105 years of history and tradition. While Chef Ishikawa had followed faithfully in his family’s footsteps, the sushi chef has since branched out (to our great fortune) to a greater variety of flavours. As the brainchild of Unlisted Collection, expect Panko to dish out extraordinary creations that are in line with those that come out of Salted & Hung, Cheek by Jowl, and Bincho. In fact, it’s run by the very same team behind Bincho. The table sitting area facing Arab Street has a wall projection displaying Tokyo’s street life, while Japanese-style murals decorate the walls around the bar area. Panko is currently the restaurant with the lowest price point on Unlisted’s team of restaurants. Their aim is to provide exquisite Japanese food with fresh ingredients at affordable prices. Lunch sets start at $17++, with skewers ranging from as low as $2 to $8 per stick. We were served with some of the delicate skewers that they have on the menu: the first on top is Salmon with Ikura ($6), while the foreground boasts Prawn ($6), and Young Corn ($2). Sauces offered to us, from left to right, were ponzu, lemon, Japanese Sea Salt, and Panko’s own secret Kushi Sauce (we only managed to discern Worchester sauce and sake in this, alas, it shall remain a true mystery). Note how the skewers are angled towards the secret sauce? A clever tip that lets you know which sauce that skewer should be dipped into! Diners have free reign over which sauces they’d like to go with their skewers but of course, chef knows best. With the sound of sizzling kushikatsu covering your whispered sweet nothings, the bar setting can make for a pretty intimate date night. Here’s a tip for those wondering how to impress even more at Panko’s. While not explicitly stated on the written menu, diners can actually request an omakase set. Meaning, “I’ll leave it up to you” or “entrust”, ordering omakase will leave the chef to decide what he wants to puts on your plate, be it a menu staple or special dishes he’ll create just for you. Wallet warning: be prepared to splurge at least $100. You’ll be asked your budget beforehand, but that’s the minimum for Omakase. This doesn’t include drinks, so make sure to do the sums! Personally, we feel that the quality and quantity more than justifies the price. These delicately-prepared kushi are first skewered with utmost care, making sure that the bamboo skewers have a split at the end – this prevents meat from falling off. Then, they are dipped in batter before being left to drip on the rack for a minute. Chef helpfully informs us that this is to prevent too much batter from coating your food. The rule of thumb for kushikatsu, as the good chef tells us, is that less batter is better. Next comes the dusting of bread crumbs, a.k.a. panko! Chef Ishikawa gently pats the kushikatsu down with an even coating of homemade panko. And finally, the deep-frying. Look at that sizzle! The kushikatsu is deep-fried forexactly 2 minutes (we timed it), before taken out and allowed to “rest” for a few seconds. Finally, it’s decorated and served, like so! We’re head-over-heels for the Mochi Bacon with Mentai Mayo ($5) Kushikatsu, which is bacon wrapped around mochi and dusted with panko. The crispy outside complements the soft and chewy insides. By then, the mochi has taken in enough “juice” to hold a slight taste of bacon as well, which fills your mouth the more you chew. A small dollop of mentaiko mayonnaise is squeezed on top and sprinkled with tobiko, which burst with each bite and leave delicate hints of umami. The first skewer is the Hokkaido Scallop with Nori Dashi Foam ($6). For seafood lovers, especially those who love Hotate (Japanese scallops), these are a must-try! The first bite starts with a crunch, and then your teeth sink into the tender, bouncy flesh. When you dip it into dashi foam, it’s a delightful combination of slight saltiness and shellfish-sweetness. Yum! And if you love Uni (Japanese sea urchin) as much as we do, you should definitely go for the latter dish which is the Hokkaido Scallop with Sea Urchin ($8). Whether you’re looking for a casual but quirky setting for a date or if you simply want to try a new bar with an extensive collection of good Japanese alcohol and food, Panko is a place that will tease, please, and overall guarantee you a good time. 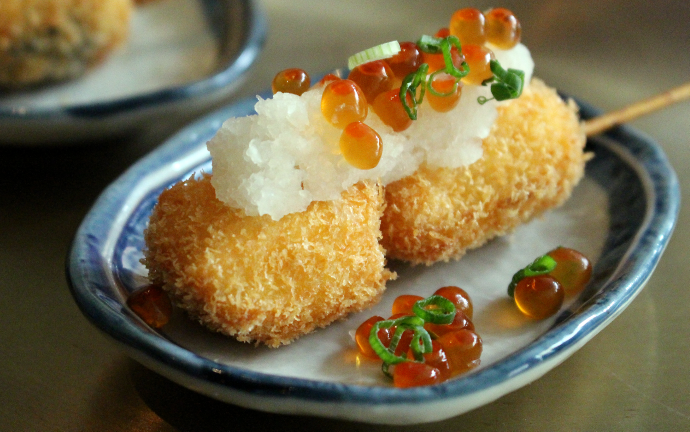 Book a table at Panko and earn 2X Chope-Dollars with code TASTYBLOG.